Since Panama City Beach is the “Wreck Capital of the South,” and since Dive Locker is the premier PADI Training Center on the Gulf Coast, getting your scuba certification with us just makes sense. The optimal time of year for scuba diving in the waters off Panama City Beach are from April to September. Below you’ll find a list of some of the wonderful dives available within a few miles of the Gulf Coast in Panama City Beach. The Gulf of Mexico’s most famous wreck is the 465′ Empire Mica, a British Ocean tanker built in 1941 and torpedoed and sunk in WWII. You can also explore the Grey Ghost, a 110′ tug; the Chippewa, a 160; coastal freighter; a 441′ WWII Liberty ship; the Chickasaw, a 110′ tug; and the S.S. Tarpon, a 220′ WWII tug. In the 1970s the Panama City Marine Institute initiated a program of artificial reef building to help bring fish habitats to the area. You can explore the breeding grounds of a variety of fish, corals and sea life.  Swim among exotic and beautiful sea life in the warm, clear waters of the Gulf of Mexico. 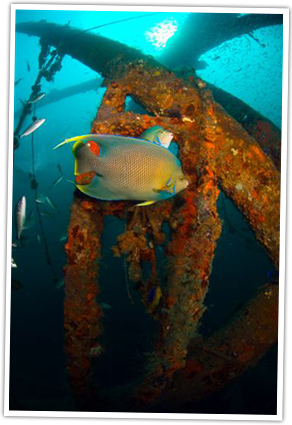 Divers can explore the multitude of artificial reef sites including the LOSS Project, Stage I, Stage II, fifteen 160′ long and 35’ high bridge spans, The City of Atlantis, Twin Barges, and many more. 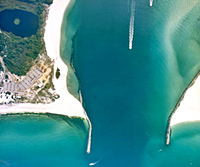 The St. Andrews Park jetties are the perfect place for all level divers. The shallow waters and no boat traffic provide a safe and exciting place to begin your diving experience. The channel side of the Jetties offer depths of 70 feet and are ideal for drift dives night dives. USS STRENGTH – a Naval mine sweeper 184 feet long with a 33 foot beam, and located 5.75 miles from the St. Andrews Pass in 75 feet of water. Decommissioned and used as a Navy dive salvage training site. The bow is broken and laid over the port side. The back three quarters is intact and sits on its keel with the highest superstructure being 55 feet. HOVERCRAFT – weighs 165 tons, is nearly 100 feet long and has a 48-foot beam. It’s located about 6 nautical miles from the pass in 75 feet of water. The craft is made of aluminum and has little growth. ACCOKEEK – a 195 foot Navy tug boat located 12 nautical miles from the pass in 100 feet of water. The wheelhouse is at 65 feet. The vessel is fully intact and is sitting on its keel. B. J. PUTNAM – a 180 foot supply vessel sitting at 105 feet. The supply boat had been converted for use as a processing platform and was sunk in 1993. It holds a large variety of marine life, and is a good fishing and diving site for advanced divers. BLACK BART – a 185 foot oil field supply ship 6.75 nautical miles from the pass sitting upright in about 75 feet of water. Her bow points due south. The bridge can be reached at 40 feet and the main deck is at 66 feet. The cargo holds are open for exploration. Divers can also explore the head (complete with toilets) and the galley which still has several appliances. The Black Bart is a popular spot for wreck training and photography. The ship is fully intact with an abundance of fish in and around the ship, with turtles spotted at times, along with catfish, founder, and grouper. The bottom is a bit silty and visibility is generally 30-45 feet at the main deck. Be sure to bring a dive light. One Halloween, a prankster chained a skeleton, complete with mask and snorkel, to the wheelhouse. 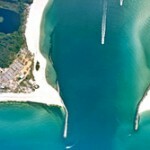 This is the undiscovered Florida. A place where water and life begin from a source that bubbles up directly from the ground. Florida Springs flow the purest, clearest, and freshest water in the world with underwater views that are absolutely breathtaking. Ponce De Leon once thought Florida Springs were the “fountain of youth” when he first discovered them. There are over 600 freshwater springs throughout Central and Northern Florida. Some Florida Springs can be explored over 200 feet deep and over a mile underground. Others can barely be seen with their small flow of water. Some are deep in the woods and covered in dense forest. Others are Florida state parks that are visited by thousands of people every day. The average temperature of a Florida Spring is 72 degrees year round which makes it excellent for scuba diving, cave diving, and snorkeling. The springs are fed through Florida’s natural underground aquifer (a river that runs beneath Florida), dumping millions of gallons of water daily. The limestone rock filters the water making it crystal clear. On the rare day when the Gulf of Mexico is not what you want to dive, within a short driving distance of Panama City Beach are Morrison and Vortex Springs. Morrison Springs is in a beautiful cypress swamp setting. The water is very blue and clear, with excellent visibility except in times of high water. The water temperature is about 67 degrees. There is a dive platform halfway across the 250 foot diameter pool that is about 25 feet deep. Scuba divers can be seen congregating here before they enter the cave. The entrance has a large cypress log across it at a depth of 25-30 feet, and the cave entrance is another 60 feet further down. According to accounts, the cave extends over 300 feet deep. Learn more about Morrison Springs Here. Vortex Springs is a commercially operated scuba diving park. It has an artificial look to it, but its a great place for dive training. There are two platforms for stationing and the depth ranges from 50 feet at the cavern to 115 feet at the entrance to the cave. Vortex Springs also has a dive shop where you can get air fills, rental gear, and snacks. The water temperature is around 67 degrees and the visibility is always great.